Our customers love how easy it is to use Azure Search and DocumentDB together to meet business goals. Tight integration through Indexers simplifies the task of indexing and searching in a variety of verticals from ecommerce to business applications. With the ability to load data with zero code, it’s even easier. We’re always looking for ways to boost developer productivity, so today we’re happy to announce the ability to add Search to a collection directly from DocumentDB with a click of a button. Seamlessly select or create a Search service, and your DocumentDB configuration will be populated automatically. You’ll have all the search power you’ve come to expect. Schema inference provides an excellent starting point to easily add features like faceted navigation, intelligent language processing, and suggestions. All of this is built on the tried and true indexer infrastructure, so expect a mature solution that’s in use by lots of customers and that will get the task done smoothly and reliably. 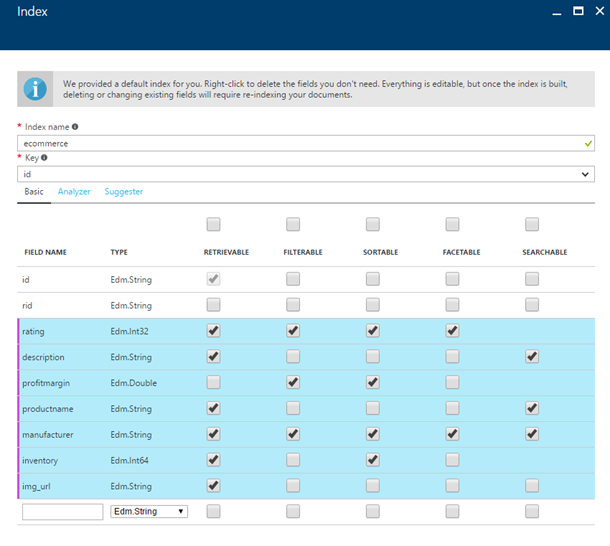 Indexers and Search + DocumentDB enable more complex scenarios as well. 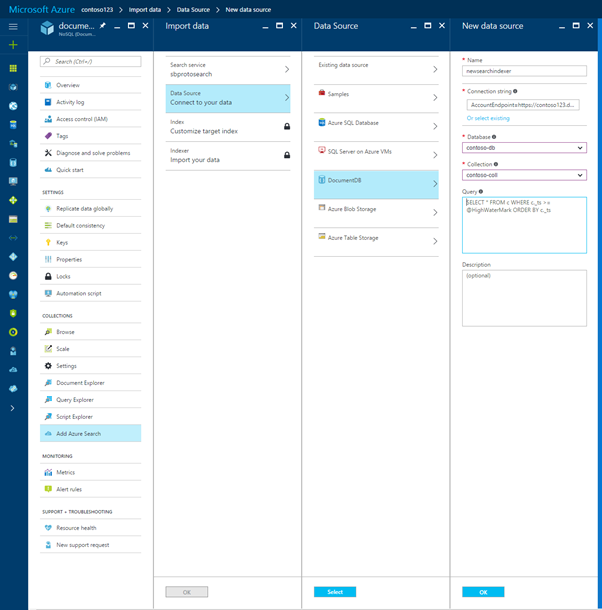 DocumentDB is a global NoSQL database, this enables you to create Azure Search service instances in as many regions as you want. Create an indexer in each Search service, all pointing at the same DocumentDB account, for a simple and rock-solid solution for low-latency, geo-distributed search application backend. We can’t wait to see what you build with DocumentDB and Azure Search! As always we’d love to hear from you on Twitter, User Voice, or the comments below. Happy coding!